In 2014 a new chapter in the history of the San Francisco 49ers begins as they move into Levi’s Stadium in Santa Clara, CA. For 42 seasons the team played at Candlestick Park, home of five Super Bowl champion teams and great players including Jerry Rice, Steve Young and Joe Montana. Candlestick Park was built for baseball’s San Francisco Giants and became home of the 49ers in 1971. From 1999 until 2013 it was home to only the 49ers as the Giants moved into AT&T Park in downtown San Francisco. The wave of new stadium construction in the NFL began in the 1990s as nearly every NFL team either opened a new stadium or significantly renovated their existing stadium. The 49ers began to seek a new facility in 1997 as Candlestick Park lacked many modern amenities including luxury and club seats that generate millions of dollars in revenue for teams with new stadiums. Two plans proposed to build a new stadium were to lure a Super Bowl to San Francisco and the 2016 Olympics. Early plans centered on building a new stadium near Candlestick Park. However, the 49ers shifted focus away from this location because the team concluded it did not offer the optimal game day experience and the geographic boundaries made it challenging for a new stadium and surrounding development. 1987 and ’93 Offensive Player of the Year Jerry Rice. 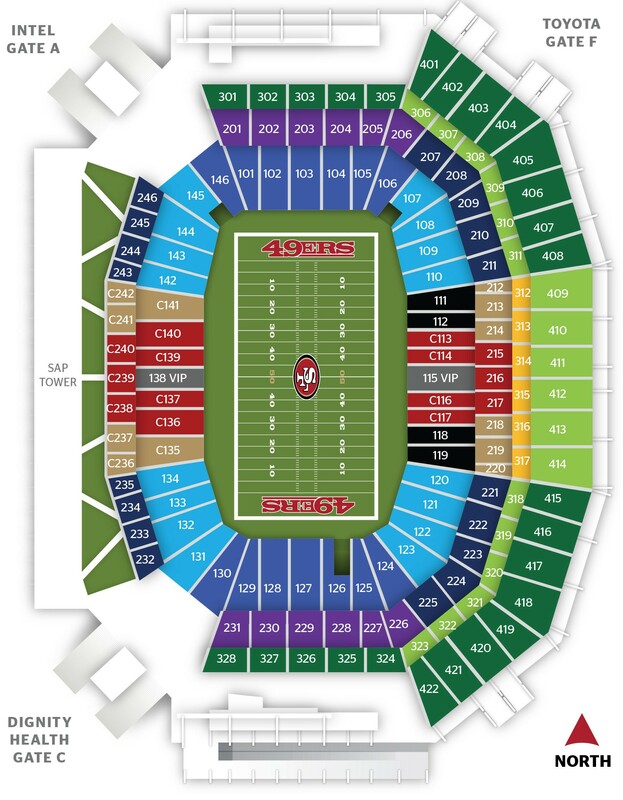 Owner of the 49ers, John York, decided to pursue building a new stadium in Santa Clara, CA where the team’s headquarters and training facilities are located. On May 29, 2009 the 49ers reached an agreement with the City of Santa Clara to construct a $1.3 billion stadium. At a cost of over $1 billion, 90% of the stadium was funded by the sale of stadium assets, a hotel tax, the 49ers and the NFL. The City of Santa Clara contributed $114 million in public contributions that included $42 million in redevelopment money. Groundbreaking occurred on April 19, 2012 and in May 2013, Levi Strauss & Co., purchased the naming rights to the stadium for $220 million over two decades. 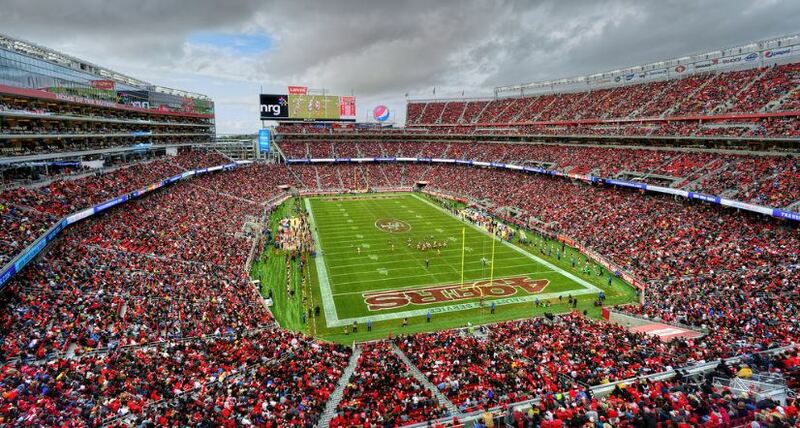 On September 14, 2014 the San Francisco 49ers will play their first game at Levi’s Stadium against the Chicago Bears. The $1.3 billion stadium is unlike any other stadium built in the NFL. It has a seating capacity of just under 70,000 with two-thirds of its seats in the lower deck. The unique design features an upper deck on just one side of the gridiron with all of the luxury suites and club seats on the opposite site in the suite tower. The suite tower contains 8,500 club seats and 165 luxury suites. Atop the suite tower is a 27,000 square-foot green/living roof that contains 40 different types of vegetation. Fans are able to see every exciting play on the field on the massive 48 feet high by 20 feet wide video/scoreboard above the seats in each endzone. The white, steel structure features an open design. Fans enter the stadium through two large 18,000 square foot open concourses, on the northwest and southwest corners. Levi’s Stadium would not be complete without a San Francisco 49ers museum. This 20,000 square-foot museum allows fans to relive great moments in team history with exhibits and interactive areas. Not only is Levi’s Stadium home to the 49ers, but is the site of the annual Fight Hunger Bowl (NCAA) and the Pac-12 Championship game. For the first time since 1985, the San Francisco Bay Area will host Super Bowl L at Levi’s Stadium on February 7, 2016.